Cider: Always drink responsibly. Unless you’re from the 1970s. It’s Cider O’ Clock here on Pete Brown’s Blog for the next week or so. World’s Best Cider is now on sale, and launches officially next week, which is nice, because it’s also the week of various Apple Day celebrations. I’ll be writing quite a bit about the book, about the themes within it and some of the fantastic people we met while researching it, over the next week or two. But to kick things off, I wanted to share with you some images of real cider ads that ran in the 1970s and can still be seen in the Bulmer’s Museum in Hereford. It’s a great place. If you think Bulmer’s have only ever done bland, tasteless commercial crap, you need to go and have your perceptions changed. Once, they made the best cider in the world, by any reasonable standards, and the evidence of this is still there. By the time the images below were being developed, they were making bland, commercial crap. But without this crap, we would never have got these ads. It’s a price worth paying. 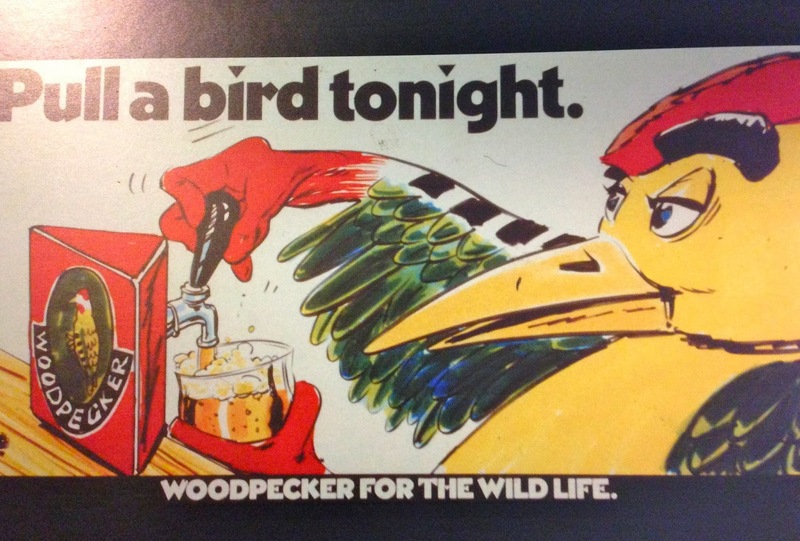 It’s ads like these that made Woodpecker such a success for Bulmer’s in the 1970s and 1980s, and they remain an inspiration – a lodestone – for alcohol advertisers in the new millennium. Happily then, this ad targets bar staff and simply urges them to draw pints of Woodpecker from the font, ready for thirsty customers with nothing but refreshment on their minds. Beer still struggles to shed a macho, boorish image after decades of advertising that many women have found alienating, or even offensive. This has led to a situation where only 15% of beer volume in the UK is drunk by women, compared to 40% in Spain. Meanwhile, one of the main reasons for cider’s success is that it is acceptable to both men and women. It’s managed to avoid the sexist tropes and stereotypes that beer relied on for so long, and cider vlume is split much more evenly between men and women. 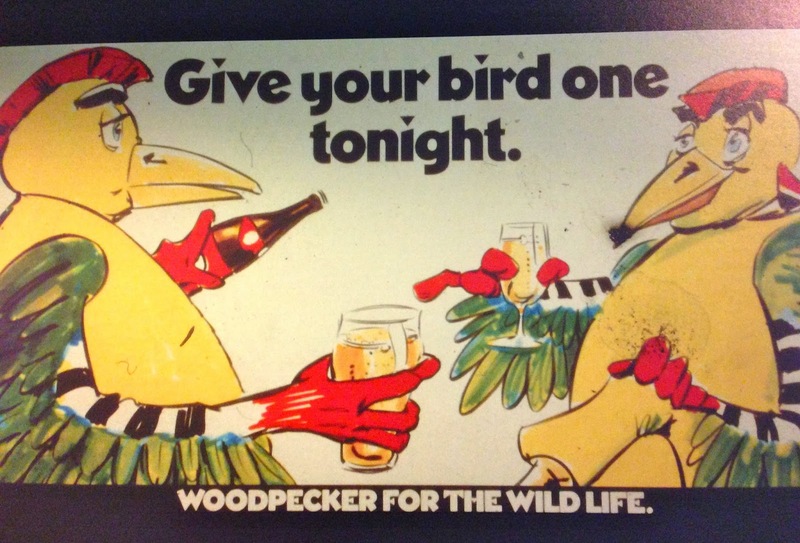 This ad, for example, simply asks us to imagine ourselves as winged creatures, as embodiments of Woodpecker’s brand values – colourful, interesting and free, chirpy and beloved, and to share our drinks in a responsible fashion with our fellow ‘birds’. 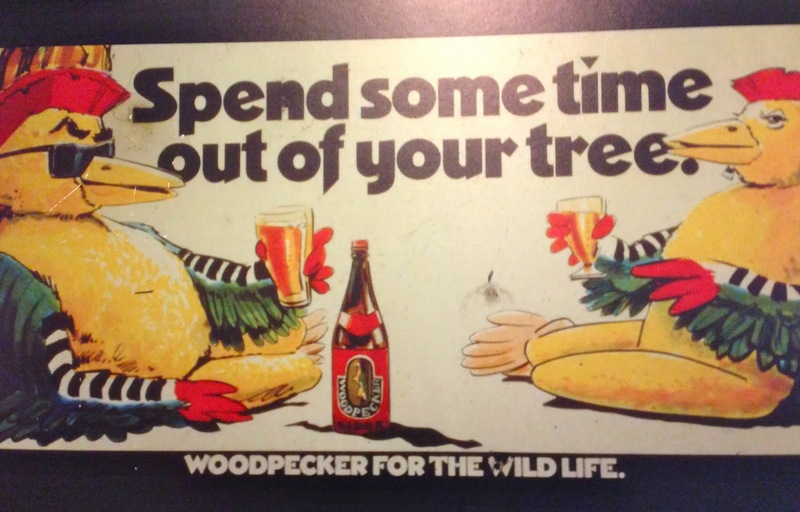 Mindful of this, our final ad depicts an abstract representation of two Woodpecker consumers sitting in a relaxed fashion, enjoying a responsible drink away from their natural habitat. Their informal poses indicate ease and comfort in each other’s company and their environment. The line simply reminds us that our usual routine and habitat – our ‘tree’ if you will – can feel restrictive, and every now and then it’s nice to go somewhere else and do something different. The very use of the word ‘some’, when it could have said ‘lots of’ or even ‘all’, reminds us that fact that consuming alcohol should be only an occasional occurrence. If only more of today’s alcohol advertisers followed the Code of Practice so closely, perhaps we’d have less of the Daily Mail/health lobby hysteria around alcohol that we have to endure today. Why do trumpets taste like hops? Shame you almost completely missed Dorset, there are a few award winning cider makers in the county that deserve a little respect. I agree with you about these ads but I do want to quietly take issue with the past tense implied in "after decades of advertising that many women have found alienating, or even offensive" – I don't think beer advertising has magically become 100% non-sexist since, er, April I guess (http://www.theguardian.com/tv-and-radio/2013/apr/06/carlsberg-advert-yet-more-sexism) and I'm not convinced there will never ever be another sexist beer advert again amen. We can hope, though! The '70s were better days in terms of gender relations and the greater liberty allowed to advertises reflects that.